Maybe I should learn to trust my instincts more. I saw some fish in Ersoski in Santa Pola, labelled Cabra, and assumed them to be scorpionfish, which I had seen on the menu in several local restaurants. It's a fish with a sweet taste and firm flesh which I had initially eaten several years before at the Zlato Sidra (Golden Anchor) in Lucija, near Portorož, Slovenia, caught fresh from the Adriatic. I had not come across the name Cabra before, but fish in supermarkets and fishmongers in Spain almost always have a label indicating their scientific name and where and how it was caught. This notification of source (NW Atlantic) confirmed it as Cabracho so I assumed Cabra (which is otherwise goat in Spanish) was a Spanish abbreviation. Having no access to the internet, I thought I would seek some confirmation from my books, which only added to the confusion. In a rather old cook book Elizabeth Cass says Cabracho has no translation into Spanish but that it resembles Rascasio and is good baked in the oven. 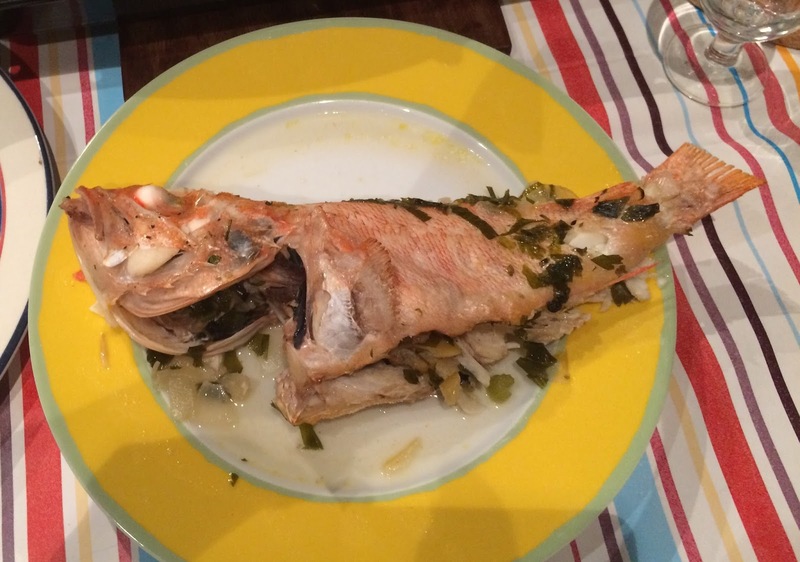 She describes Rascasio as an essential ingredient for fish soup. I have since seen what I thought to be Scorpionfish labelled Gallineta (little chicken) but Dr Cass says this is Sand piper, a fish "resembling Rascasio but greyish in colour and very good cooked in the oven". But the Gallineta I had seen were red - definitely not grey - and looked like Scorpionfish to me. Alan Davidson 2002 Prospect Books: ISBN 978-1-903018-94-1) Here he describes Cabracho as Red Scorpionfish (Fr Rascasse rouge) and particularly recommends the cheeks as not unlike lobster. In France, Rascasse is regarded as an essential ingredient in bouillabaisse. Davidson lists Rascacio as Black scorpion fish and Gallineta as Blue mouth scorpion fish, reddish brown in colour but with the inside of mouth blue. My Gallineta did not have a blue mouth. It was definitely Cabracho , red scorpionfish! Davidson describes Gallineta as similar to Redfish, also known as Norwegian haddock, which is found in the Atlantic. 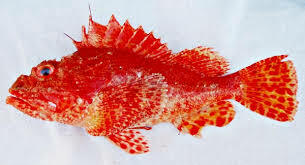 Or not bother and just assume that if it looks like Scorpionfish, it probably is and will taste delicious! it's almost certainly some variety of scorpionfish and I recommend you buy, cook and enjoy. Baking or poaching is recommended or use in fish stew. I have posted a recipe which I tried in Santa Pola in August 2016. The spines can be mildly venomous, but can be removed by your fishmonger but if you handle carefully the poison is denatured in cooking and rendered unharmful. 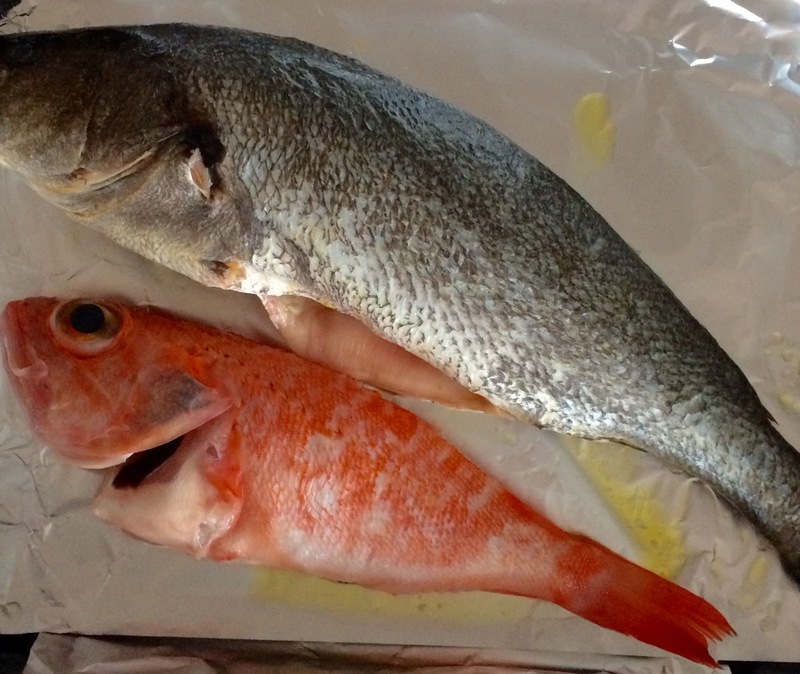 We were staying in Santa Pola with family and friends and I decided to oven cook a whole Corvina as it had been such a success the year before with a family gathering. Whilst I thought that one large Corvina was enough for 6 adults and 4 children (two of whom were not fish fans), my daughter-in-law, Nicole, (rightly as it turned out) thought we needed more. There was Cabracho on the fish counter and I couldn't resist. I made a court bouillon with a small chopped onion gently fried and softened in olive oil, added a stick of celery and some chopped celery leaves and one carrot finely chopped, a large cup of water and brought to the boil and simmered for 20 miniutes. (I had also sprinkled some sumac over the fish). Pour over the court bouillon and one glass of white wine (or dry sherry or vermouth), Add a splash of olive oil and juice of half a lemon, cover with foil and place in heated oven 160C for about 30-35 minutes. Before serving squeeze over remaining juice of half lemon. And did the cheeks taste like lobster as the books suggest? I don't know. One cheek was eagerly devoured by 6 year old Jerome who is a fish lover and the other by 10 year old Leelah who doesn't normally like fish. When asked what she wanted for dinner the following day, Leelah exclaimed in a loud and enthusiastic voice "Fish cheeks"!